Centrum Wiskunde & Informatica: Media Semantics: Who needs it and why? Media Semantics: Who needs it and why? 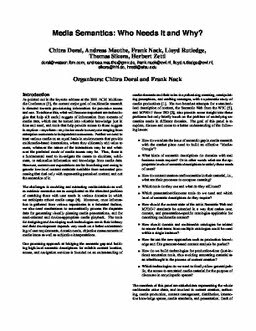 Dorai, C, Mauthe, A, Nack, F.-M, Rutledge, L, Sikora, T, & Zettl, H. (2002). Media Semantics: Who needs it and why?. In Proceedings of the tenth ACM international conference on Multimedia (pp. 580–583). ACM Digital Library.